Home→Unique Claims to Fame→Pest House Lynchburg, Va. It takes a hero to wade soul-deep into a miasma of death and laboriously rescue victims teetering on the abyss. Dr. John Jay Terrell was that kind of a hero. The good doctor volunteered to staff the first of 39 hospitals in Lynchburg, Va., most of which sprang up in tobacco warehouses, shoe factories and homes during the American Civil War to address Confederate casualties. Terrell, a Quaker, adhered to his sect’s doctrine of pacifism and refused to join the fighting forces. Nor did he pay to have another man enlist in his stead as did some of his brethren in the faith. 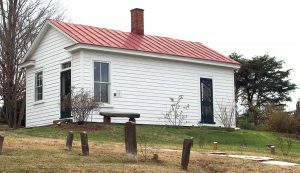 “I would describe him as courageous,” said Leah Harness, a volunteer docent for the Pest House Museum and surrounding cemetery located on the near west side of Lynchburg. But Terrell’s dedication and ingenuity saved a lot of lives. He noted the deplorable conditions of the hospital built in the 1840s — whose standards of medical care and sanitation were almost nonexistent — and spearheaded major changes. His medical innovations, scoffed at by many of his colleagues, plummeted the mortality rate of Pest House patients from 50 percent to 5 percent. Terrell was one of the first doctors to wash his hands and sterilize his instruments between surgeries. He painted the patients’ room black to ameliorate the ocular hypersensitivity to light caused by the smallpox virus. Terrell prescribed a special diet, “including sauerkraut,” according to Harness. “I had a barrel of linseed oil and limewater to use as an ointment, with which I greased sores, so had no more sticking of clothing,” Terrell wrote of his three-year experience at Pest House. After the war, the penniless doctor opened an office on his farm outside of town and served the local populace — often traveling on horseback — until his death at 93 years of age in 1922. 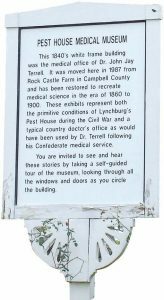 In 1987, Terrell’s office was moved to the 26-acre Old City Cemetery, which hosts the graves of an estimated 2,000 slaves and Confederate soldiers. The historical parcel also includes the Hearse House, Caretakers Museum, Station House Museum, Mourning Museum and a chapel still used for weddings. 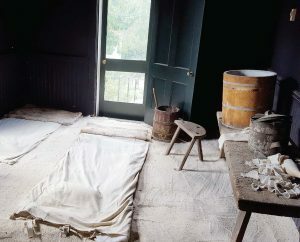 The office was joined with a quarantine room to “give a more complete picture of 19th-century medicine, while still telling two very separate stories,” according to the complex’s website, www.gravegarden.org. Today, visitors can indulge in self-guided tours around Pest House, listening to an audio narrative while looking through the windows at the exhibits inside. Artifacts include Dr. Terrell’s “poison chest” — similar to the modern medicine chest — asthma chair, medical instruments, an 1860s hypodermic needle, old medical books, chloroform mask and a Civil War era surgical amputation kit. “They come from all over the world,” said Harness, citing France, Belgium, Germany and Brazil as nations of origin. 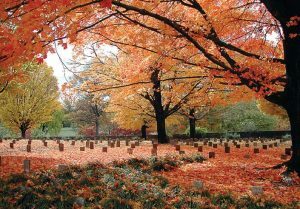 The influx of visitors benefits the economy of Lynchburg, population 80,212, and several hotels and eateries in town make it a point to recommend the Old City Cemetery to their boarders and diners. Perennial beauty arises from amidst the graves. 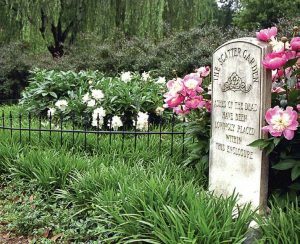 “The cemetery is also a beautiful garden,” said Harness. “There is almost always something blooming. The museums are open 10 a.m. to 3 p.m. Monday through Saturday and 1 p.m. to 5 p.m. Sunday. For more information, call (434) 847-1465.